So…I managed a couple of drama-free days, which, unfortunately, seem to translate into blog-free days. So, blog=drama, right? Anyway, I spent a quiet morning at home, studying and composing a shopping list so I could, you know, actually eat tonight. When the time came when I could take a break from the studying, I headed down to my car, turned the key…and nothin’. My car has been temperamental all winter, so I didn’t think much of it, it’s been taking two or thee tries to get it started. After ten, it TRIED to turn over, but it still didn’t start. A few more tries, and a jump-start attempt later I did what any responsible grown woman would do. I called my Daddy for help. My wonderful father drove an hour and a half to look at my car. After doing some mechanical magic, Dad declared my battery to be fine, and my starter being what has issues. Which means, a trip to my home-town this weekend, providing I can get my car started, of course. Fortunately, every where else I’ll need to go this week can be reached easily by bus. Dad was kind enough to drive me to the grocery store and back so dinner, at least, is right on track. I decided to make one of my favorite comfort foods. We call it tortilla casserole. I don’t know if my mom found this recipe somewhere, or if she made it up–I’ve never seen her use a written recipe to make it, and I was taught to make it without a recipe as well. 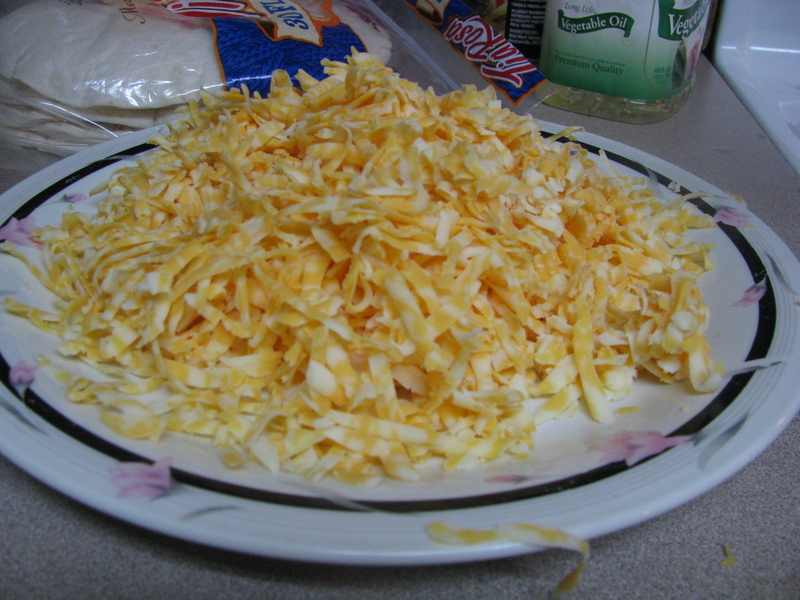 Shredded cheese. Growing up, we usually used mild cheddar, because that’s what we had in the fridge. Here, I used colby jack. How much? Yeah, no clue. One of those things that, because I’ve never seen this recipe written down, I don’t know how much to tell you. I will tell you this: I love cheese. My dad doesn’t, so I’ll use more cheese when I’m making this for myself than I would if I were making this for my family. Heat a large skillet over high heat. Add meat (if you are using ground turkey, or some other low-fat meat, you’ll want to add a bit of oil to the pan first), onion and green chilies. Stir constantly, until meat is browned and onions are clear. 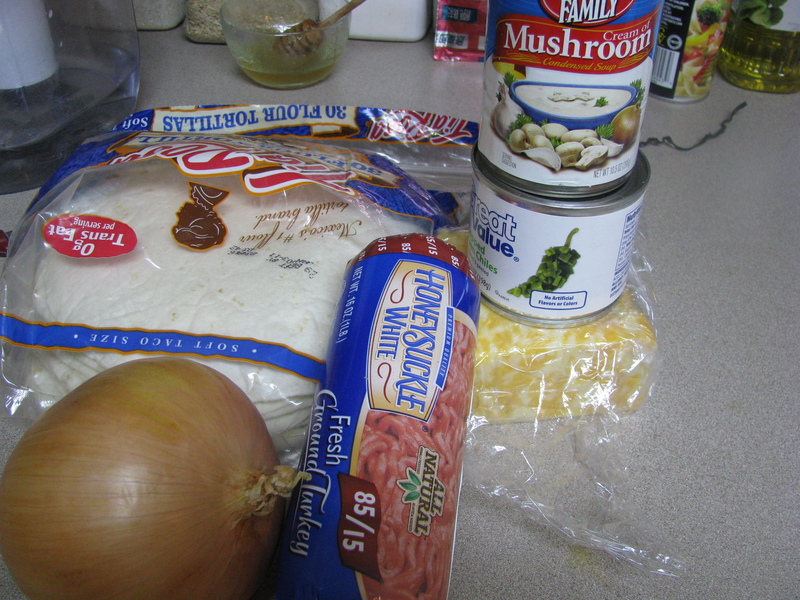 Add the can of soup to the meat mixture and blend throughly. 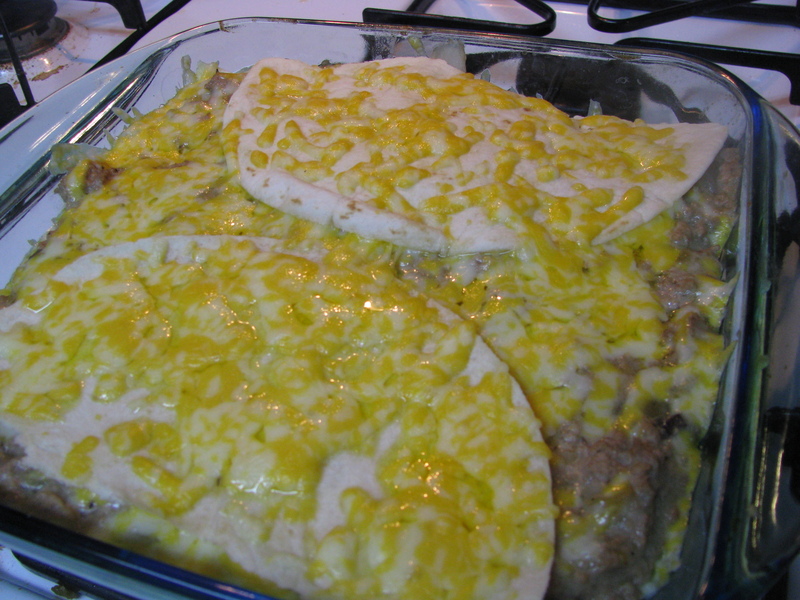 In a line the bottom of a 9×9 baking dis with a layer of tortillas. 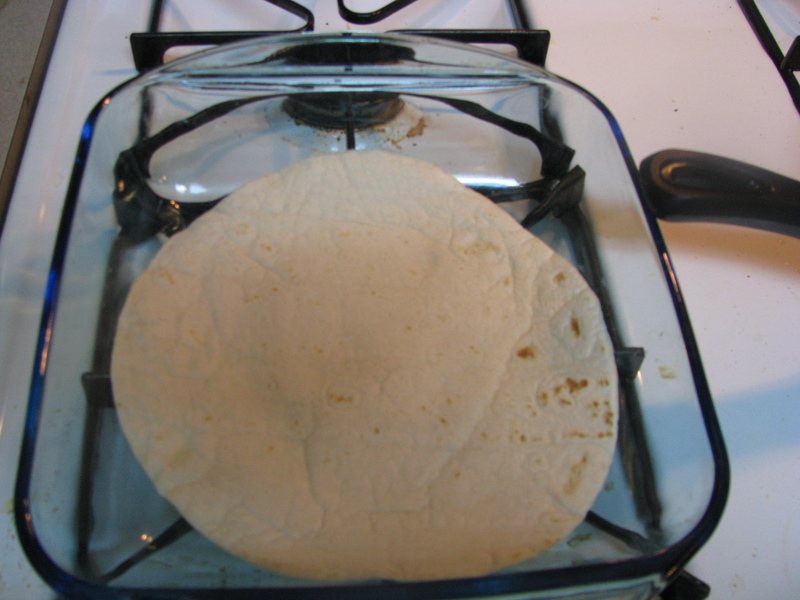 Now, tortillas are round, and the baking dish is square, and this can cause some issues. I thought I got a picture of this next step, but apparently I didn’t. Grrr. Anyway, tortillas are easy to crease and tear, like paper. So, take another tortilla, fold it into fourths, and tear it so that you’ve got nice little patches for the corner. The bottom is the only layer that you need to worry about covering completely. Spoon some of the meat mixture on top of the tortillas, spreading evenly. You should use about a third of the mixture. yum. And yeah, I have very little counter-space. The stove often pulls double-duty. 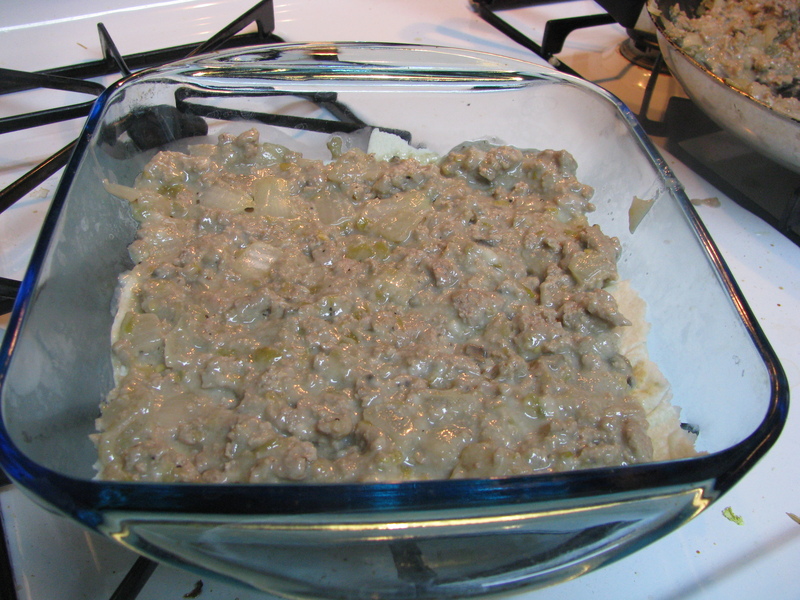 Next spread a generous amount of cheese over the meat mixture. Or not, depending on who your making this for. I had to restart my computer twice before I could upload this image. I hope it was worth it. Next, tear a tortilla in half, and line up the torn edges with opposite sides of the pan. If it’s not on the bottom, you don’t need to worry about covering the whole pan. 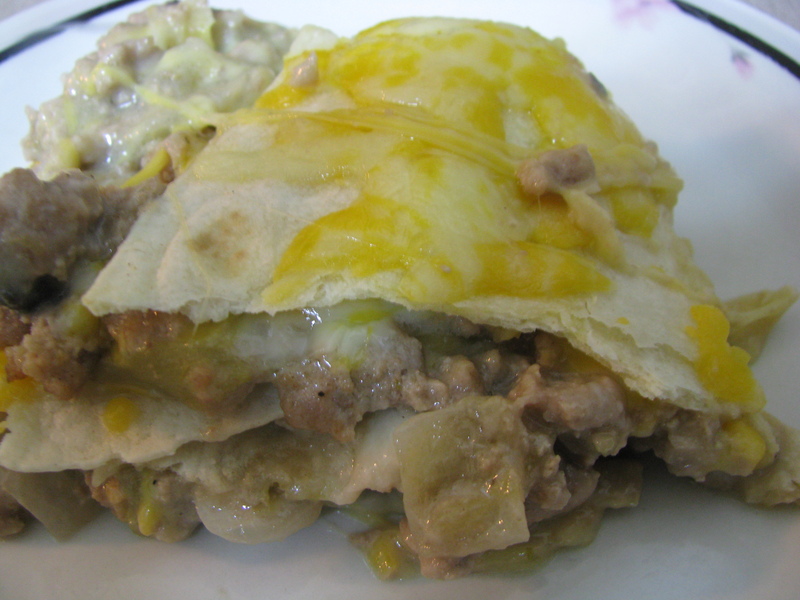 Continue layering the meat mixture, cheese and tortillas like a lasagna, until you’ve used up all of the meat. I can usually get three layers. 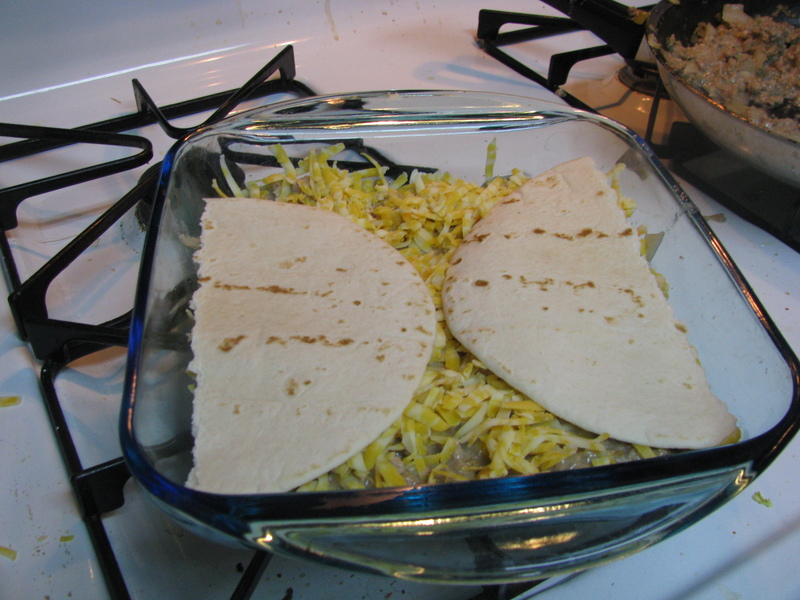 You’ll want to alternate what side you put the straight edges of the tortillas on, to give your casserole added support. 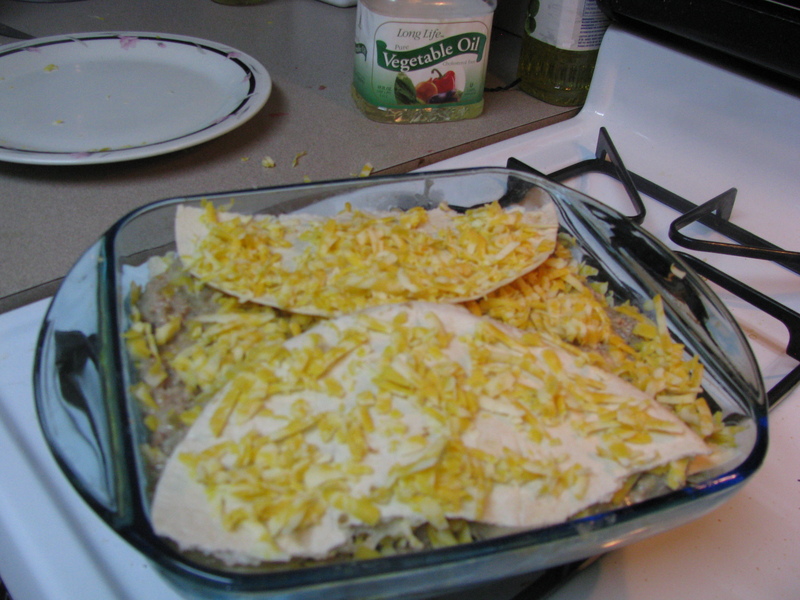 I like to end with a layer of cheese on top of the last tortillas. Hmmm. Maybe I should have grated more cheese. Okay, so I'm not a food photographer, and the light in my kitchen is less than great. Still...are you curious, yet? 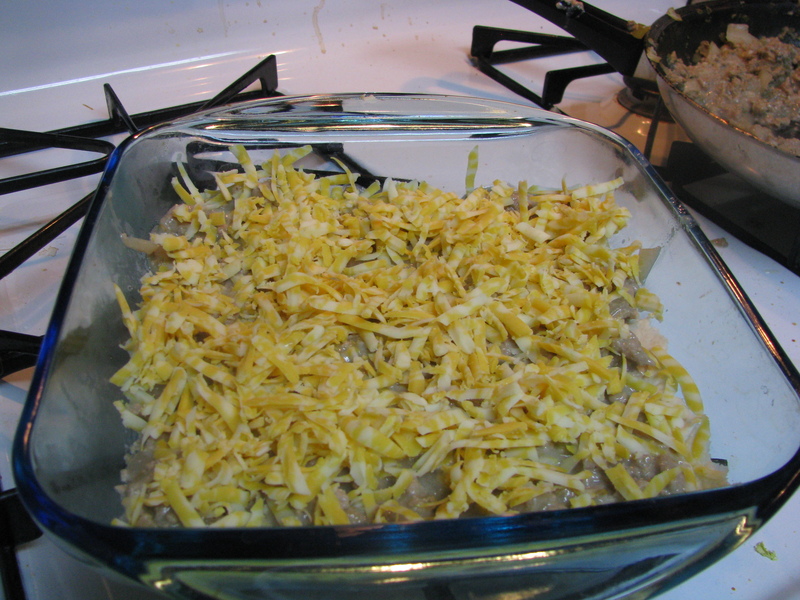 This casserole will serve about six, depending upon what you’re using as side dishes. Taste wise, the chilies give a nice little kick, but not too much of one. I’ve had people who only eat the extra-mild salsa rave about this dish. Anyway, go, cook, enjoy! And be grateful when you put your key into the ignition of your car and it actually starts up.